In traditional Chinese family culture, descendants of several generations from the same ancestor lived together and formed a big family system. This kind of autonomous family system was the basic unit of traditional Chinese society. Such kind of social structure had existed until the Communist Party took power in 1949 and has been totally destroyed after the Chinese Communist regime started to impose the one-child policy forcefully. Chinese children follow their father's family name. This is the same as western culture. Nowadays in China it is legally fine for a child to follow either father's family name or mother's family name. Within each family system, of course people except those who joined this family system through marriage all have the same family name. When calling the full name, Chinese put family name first before given name, which is opposite to the way of calling full names in English. In order to avoid confusion, I won't address the name parts as first name or last name. I will only address them as family name and given name. Chinese people also simply call each other's given name rather than family name between familiar friends or colleagues, which is similar to western culture. The English imitation in the above table is not accurate and has not imitated the four tones either. Please follow the pinyin for accurate pronunciation. Most Chinese family names include just one single character. As much as I know there are only several dual-character family names in Chinese. Chinese given names can have one or two characters. Within each family system, besides the common family name, descendants often specify another common character in their given names for each generation. This common character in given name is called the "Spreading Character", which is an indication of the person's generation within the family system. The Spreading Character can be either the first character or the second character of the given name. For example, 孔祥熙 is the name of a famous person who lived in the last century and was a descendant of Confucius. See the illustration below. 孔 is the family name. The first character of given name 祥 is the Spreading Character of his generation. The other character of given name 熙 is his unique given character to identify himself. Therefore, in traditional Chinese family culture both the family name and one character of the given name are pre-decided. The child only needed to be given one extra character. When I went to my father's birth-place in Heilongjiang province for holiday in early 1980s, I could still see such naming custom of traditional Chinese family culture. The people of the whole village had the same family name except some descendants' spouses. For each male, after learning of his name, you would know he was of which generation. When talking with relatives in village, I often heard my brother introduced ourselves by saying "My father is of the generation of the character de". However, we three brothers actually did not follow the Spreading Character of my father's genealogy because my father left his birth-place when he was very young and did not have frequent contact with the relatives at his birth place. We three brothers' names were actually given by our mother's mother. The Spreading Characters of Confucius' descendants were bestowed by emperors of different dynasties in history. After using up all the bestowed characters, the head of the Confucius family system would propose a new series of ten well-selected characters again and submit them to the Emperor to be authorized. After being authorized by the Emperor, the following ten generations would use the granted characters accordingly. If your Chinese language is very good, you can check the details of the Confucius' genealogy on the web site of the Archive Bureau of Confucius' hometown Qufu. Now Confucius' descendants all over China continue using these Spreading Characters in a cycling way. The family of Mr. Song Jiashu was one of the most prominent family of China in the last century. His three daughters were married to the three most prominet Chinese men. These three sisters' names were named in the way of traditional Chinese family culture. Their Spreading Character 龄 (l¨ªng) is located at the last character in their names. 龄 (l¨ªng) means age or years. 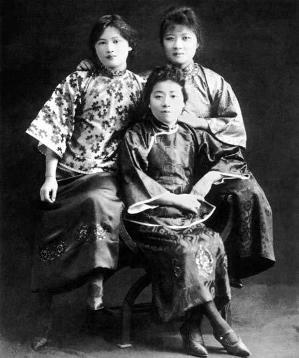 The Three Song Sisters while young. From left: Song Qing Ling, Song Ai Ling, Song Mei Ling. 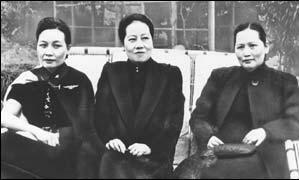 The Three Song Sisters in 1942 in Chongqing. 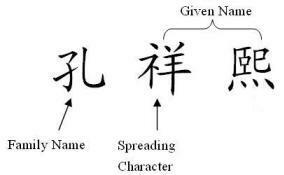 Although this naming convention using Spreading Character was an important part of traditional Chinese family culture, in current times people do not follow this naming rule any more. Many Chinese baby names use simply one character as the given name. Top of page "Traditional Chinese family culture's naming custom"
Return from "Traditional Chinese family culture's naming custom" to "Foreigners in China"